Let’s be honest, eating is everyone’s favorite part about vacation, right?! 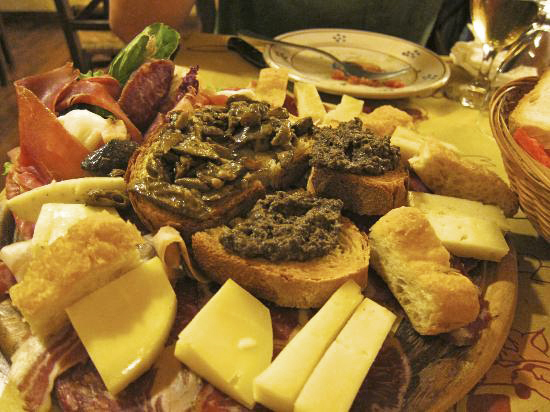 Visiting museums and churches are all dandy, but you must also taste Florence to experience the best of Tuscany! I get asked so many times for tips from friends and readers that I’m trying to write them all down, so it’s easier to share than long, messy emails. 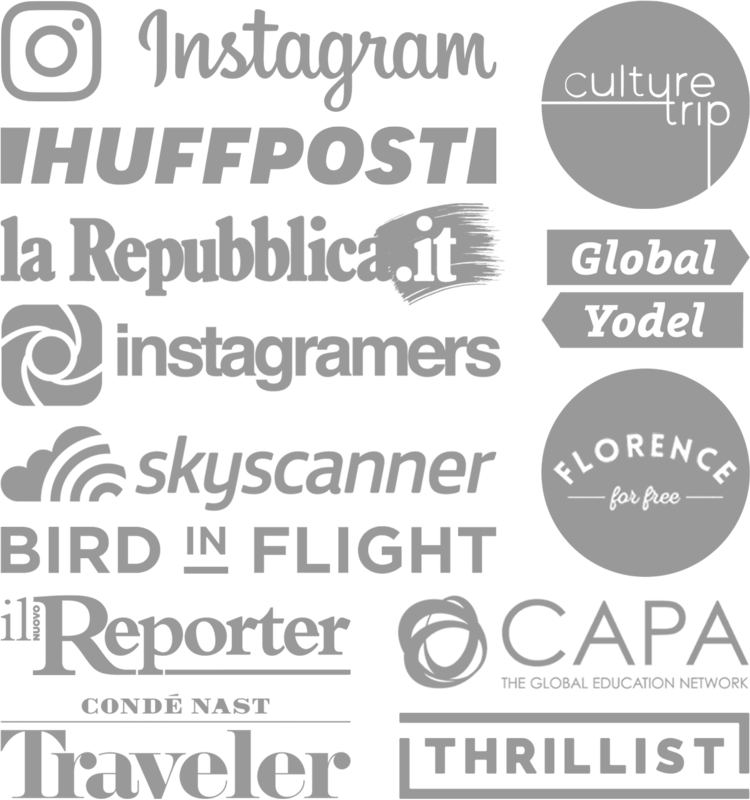 So, here we go, one of many posts to come about where to eat and drink in the best spots around Florence. Let’s start with my favorite watering holes around Santa Maria Novella’s baptistry and piazza. This a spot that I love to frequent. Most people I know in Florence have been here more than once, so it’s really popular among the locals. It has a great mood, fun music and bartenders who can make anything. My favorite cocktail so far was a berry rum drink with juice, no clue what he put in there but it was so refreshing. They have a nice aperitivo spread with prosciutto, cheese and veggies that you can eat along with your 7€ cocktail… or glass of wine of course. Check it out and try and get a seat out in front. It’s a block from the Arno River on Borgo Ognissanti 42. I can eat this all day with this Gewürztraminer! 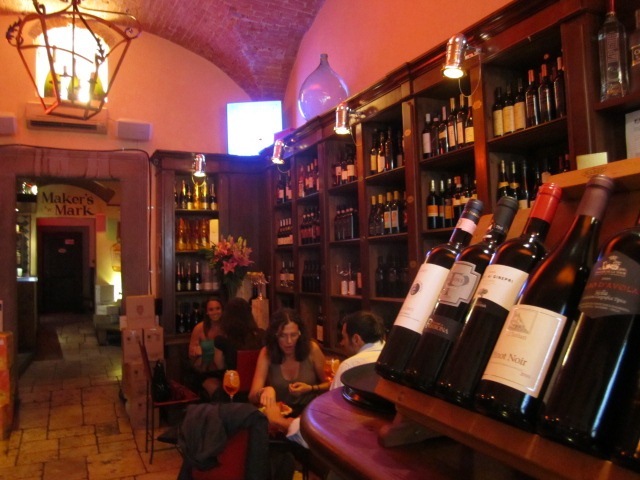 This wine bar is attached to Hotel Croce di Malta which are both owned and run by my Italian family, so you may find me here more than I’d like to admit! The wine list is impressive and they make a killer Spritz Aperol, as we all know it’s an addiction that I’m trying to work on! 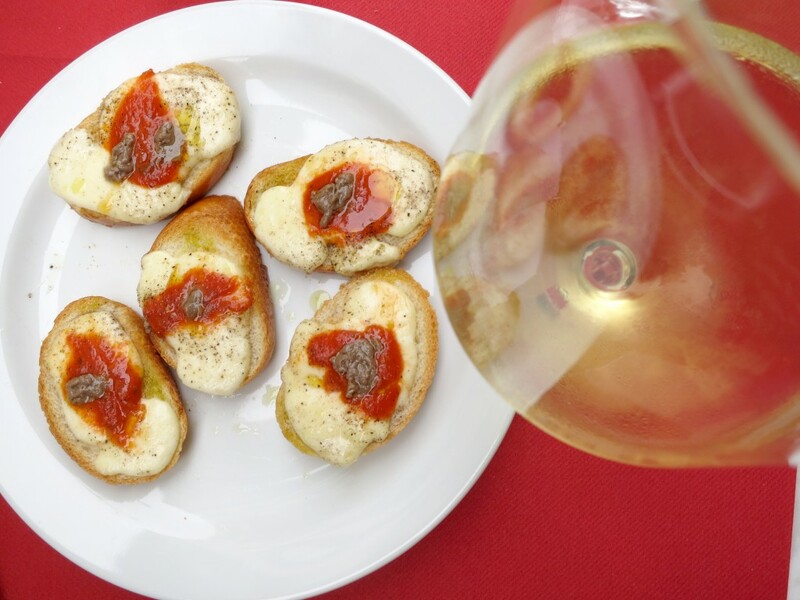 My favorite appetizer is their specialty—crostini di mozzarella e acciughe—5 for € 5! It’s toasted baguette with mozzarella, tomato sauce, anchovy paste and pepper. I happily eat all five and make my husband get his own, grrrrr. I tend to sit outside when the weather’s nice. The great perk is that they have a full kitchen since they use the hotel’s. So, you can stay until late and order from their full menu which includes pici al cacio e pepe, pizza, salmon, etc. 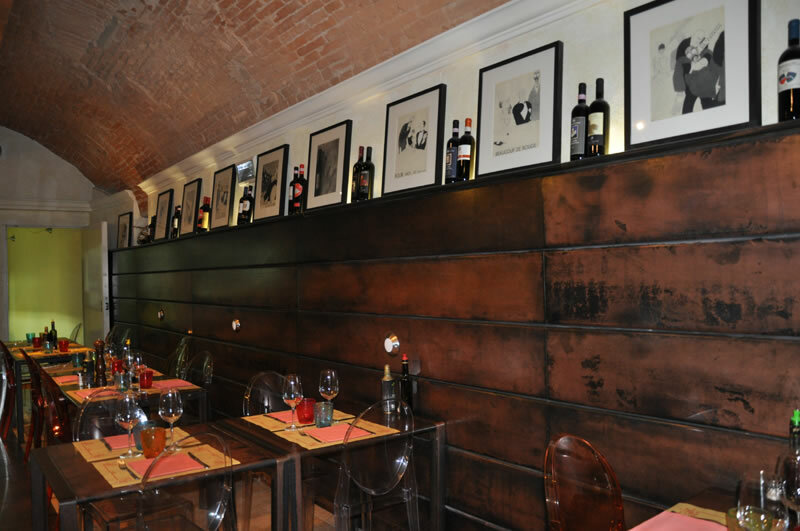 It’s easy to find right off Piazza SMN on Via della Scala 9. This 1869 traditional treasure is most famous for their bistecca alla fiorentina, and one of my favorites for this juicy dish. The staff is nice, but sometimes it’s hard to get a table. I finally went an hour before dinner to reserve space for two and it was so worth the wait. You may have to sit between other local patrons, but everyone’s friendly and the food will keep you so preoccupied you won’t even notice. Get the bistecca alla fiorentina with a plate of spinach, red wine and dessert—any dessert! It’s a block behind Piazza SMN on Via Porcellana 25r. Tip: cash only. 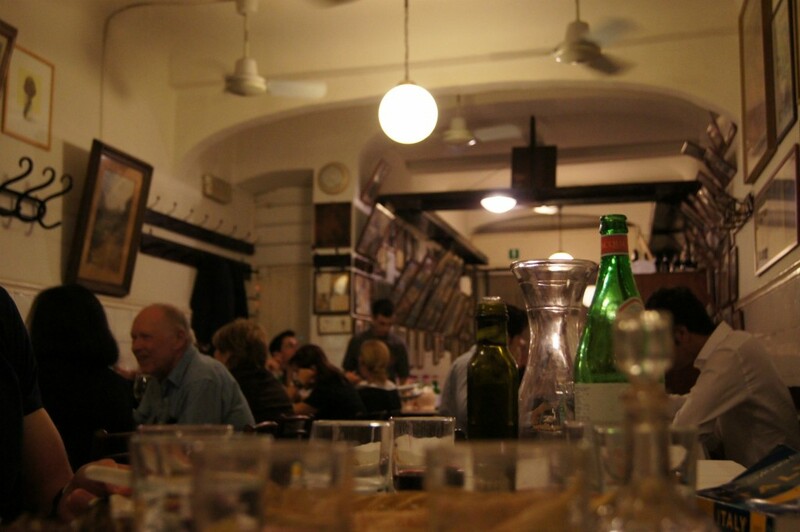 Right next to Sostanza is this fine trattoria. I really really love this place and have been here tons of times and always happy to return. 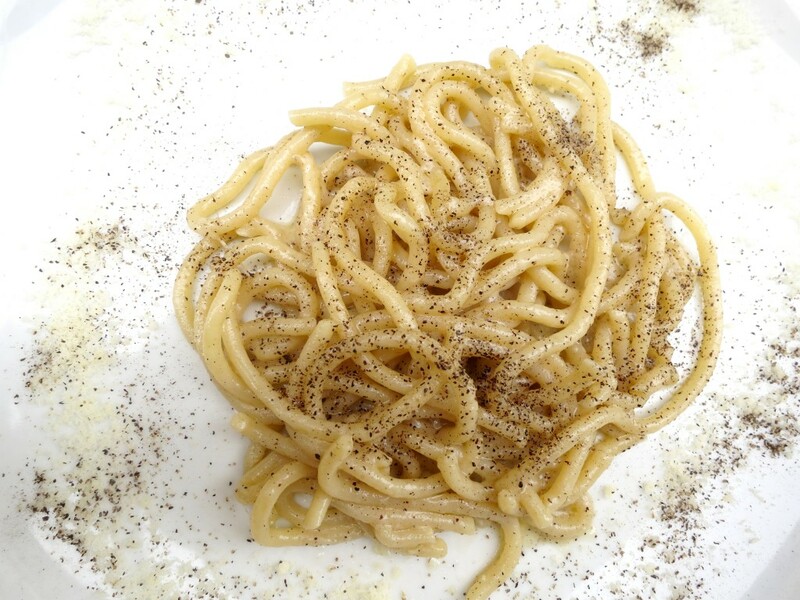 Gobbi meaning ‘humpbacks’ serves a mean bottarga—cured fish roe—pasta that’s divine! It’s always packed with tons of locals and tourists. It’s dark and has a very charming Italian ambiance. The layout is scattered throughout a few rooms giving it a nice sense of intimacy. They have great steak too, but I recommend going with other items like the pastas and meats. The wine list is amazing and the staff is incredibly nice and helpful. Don’t forget to try the coccoli e prosciutto! It’s in between Sostanza and Sei Divino on Via Porcellana 9r. This spot is great for pizza and they have lots of seafood on the menu. It’s the most casual on this list, so great for kids and large groups. The space is crisp and modern and always seems to be busy. It’s also split between a ristorante and a pizzeria, so basically there are two restaurants in one! I used to go here before a movie for an easy bite. Their menu items are endless, so there’s something well priced for any experience you’re looking for. There you have it, my gems of the area! Any of which you’ve been to or want to try? Yum! All these posts about Florence are really giving me the travel bug (for Italy, of course). Also, you are so very lucky to have a wine bar / hotel in the family!! Ya Cassandra, it’s nice to have a ‘home’ downtown were we can also go to! Writing this post made me hungry! I have so many more to write, hard to keep up with all the great spots here! They all look great, I will have to check out a few of them next time we visit! Reach out next time you visit! There are so many awesome spots that I haven’t written about yet and am getting hungry just thinking about them.